<p align="center">"This shows double lugging of the neutral in a meter can." Double lugging is probably one of the most common code violations. Here in WV, it is common to shove as many conductors as possible into a terminal. If there isn't enough room, then strands are cut off of each conductor so they'll fit into the terminal. I was wondering the same thing Sparky. I have seen many 100amp Meter pans with one (central) lug. It must have been permitted at one time. Our meterpans on LI even have a separate lug for a bonding wire if necessary. 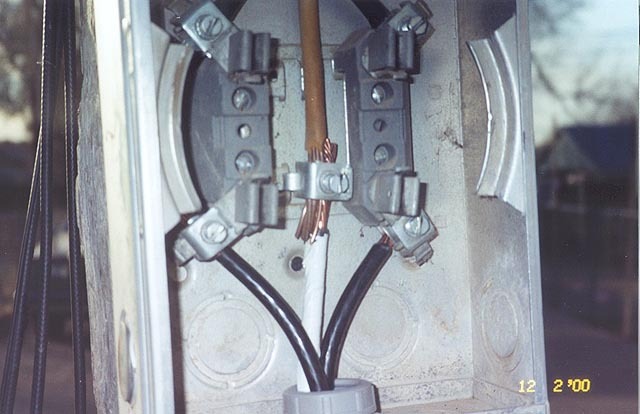 When I first started in the trade, the local utility supplied all of the meter cans and they only had one neutral conductor lug, but their rules required that the neutral be continuous from the weatherhead to the service panel, so only one lug was required. I don't know who supplied the ones I have seen, but they had only one lug and the wires (not continuous) just laid on top of each other. They Meterpans (cans?) were round and the ring type.